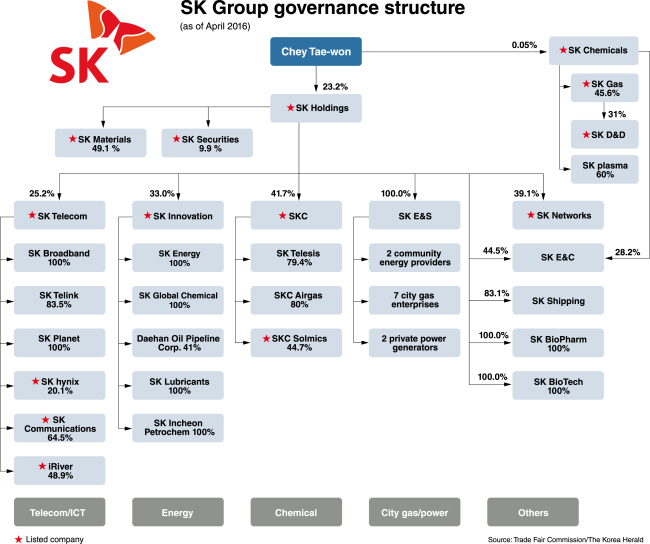 The way SK Group reorganized its whopping 88 affiliates and subsidiaries into a holding company structure -- billed as an advanced model of multi-company governance -- is a subject of fervent study by Korea’s other family-run conglomerates often criticized for opaque governance. Through a series of carefully devised steps spanning well over a decade, Chairman Chey Tae-won simplified the group’s tangled ownership and eliminated highly controversial cross-shareholdings. He also secured greater control over his 164 trillion won ($148 billion) empire, defending himself against potential hostile takeover bids. All this without much of his own money. “SK Group has tidied up its ownership structure over the past decade, with the latest big step being last year’s merger between SK Holdings and SK C&C,” said Yoon Tae-ho, an analyst at Korea Investment & Securities. Chey now exerts influence over the entire group through his direct ownership of a 23.2 percent stake in the merged entity SK Holdings, which is supplemented by a 7.5 percent stake owned by his younger sister and other family members. Some 22 percent of the company’s shares are held by the firm as treasury stocks. SK Holdings’ second-largest shareholder is Korea’s National Pension Service, with 8.58 percent of equities. No other shareholder owns more than 5 percent. The situation is a stark contrast from 2003 when SK Corp. -- the precursor to SK Innovation and SK Holdings, which then served as the group’s de-facto holding firm -- became the country’s first known target of a hostile takeover attempt by a foreigner. Back then, Sovereign, a Dubai-based investment fund, had sought -- to no avail -- to oust Chey from SK Corp., with 14.99 percent of shares. Chey and other members of the founding family held just about 1 percent of the company’s shares directly and controlled around 15 percent indirectly through other SK companies. Stung by the proxy battle with Sovereign, SK Group accelerated efforts to solidify ownership and became the second chaebol group in Korea, after LG, to adopt a holding company structure in 2007. It has since conducted a series of splits, spinoffs, mergers and equity swaps to further streamline the business portfolio. Last year’s SK Holdings-SK C&C merger gave Chey a direct 23 percent control of the post-merger SK Holdings. Before, he had 0.02 percent shares of SK Holdings and 43.4 percent of SK C&C., while SK C&C controlled 31 percent of SK Holdings. “SK Group has simplified corporate ownership and enhanced governance transparency, but in the process it has shown how an affiliate company like SK C&C can be used by the controlling family to pass down group controls to the next generation, without burdening them with inheritance taxes,” pointed out Eom Su-jin, a researcher at the Seoul-based Corporate Governance Service. History aside, SK Group now looks neatly organized along four main business lines, with its telecom and information technology units under SK Telecom; energy companies under SK Innovation; chemical firms under SKC; and city gas and power providers under SK E&S. Companies such as SK Materials, SK Securities and SK Networks do not belong to any of these groups and are owned directly by SK Holdings. SK Chemicals also sticks out from this formation, as it is 20 percent owned by its Vice Chairman Chey Chang-won and other members of the group’s controlling family. Chey Tae-won’s direct ownership of SK Chemicals is a meager 0.05 percent and the group’s holding firm has no share in it -- a reason why some experts think it may split from the group in the future. SK Chemicals Vice Chairman Chey is a cousin of SK Group Chairman Chey. SK Chemicals have listed companies SK Gas and SK D&D as its subsidiaries. Looking forward, SK Group may seek to break the current ownership chain linking SK Holdings, SK Telecom and SK hynix. “SK hynix, as it is a second-tier subsidiary in a holding company structure, has limitations in carrying out mergers and acquisitions,” Kim Kyung-min of Daishin Securities said. By law, the ownership of a third-tier subsidiary is allowed only when the second-tier subsidiary acquires 100 percent of its shares, meaning that if SK hynix wants to acquire a company, it has to buy its entire shares. “To expand SK hynix’ investment capacity, SK Group could try making the chipmaker a direct subsidiary of SK Holdings,” he said.